Layers There are 41 products. 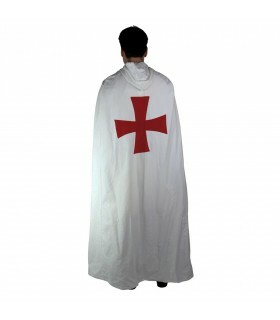 Knights Templar white coat with red Templar cross. For men and women. Made of 100% cotton. P>Recommendation Hand wash. 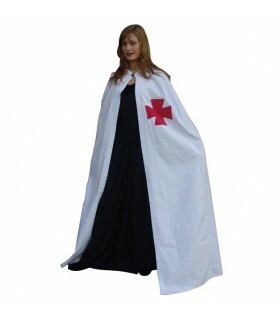 Medieval cloak with red anchor cross and lace closure. Made of thick cotton, canvas and is ideal to shelter from wind and rain. 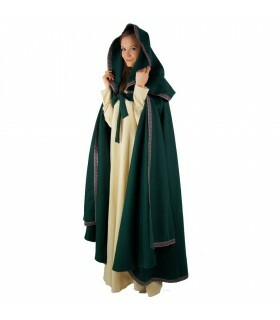 Layer medieval short with hood model Kim. It is made of cotton 100%. Closes via a button. The layer measured 75 cms. long in front and 100 cms. in the rear. 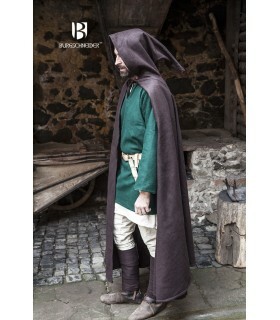 Layer Medieval Burkhard Unisex various colors made of cotton. Fastens in front with a wooden button. One size fits all. Includes hood.Recommended machine wash at 40º C.Perform a wash cycle gentle.Do NOT use dryer. 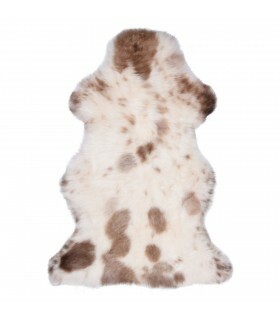 Lambskin in tones that vary from natural white to ivory. 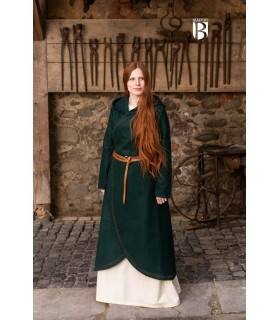 unique pieces that medieval Vikings and other ethnic groups dressed. The approximate length is 90 cm. but can vary as no skin are alike. 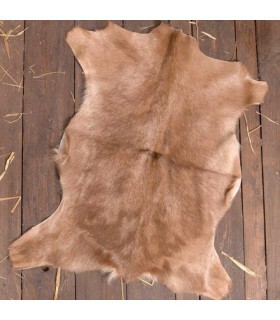 Lambskin brown. 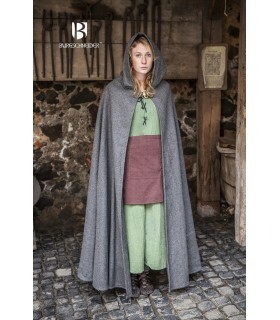 unique pieces that medieval Vikings and other ethnic groups dressed. The approximate length is 90 cm. but can vary as no skin are alike. 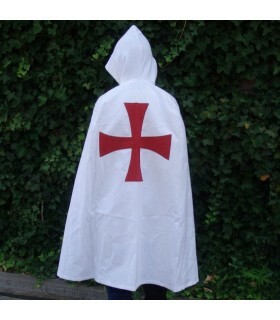 White Knights Templar coat with big red Templar cross on the back. For men and women. Made of 100% cotton. 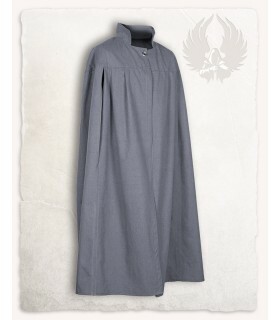 Recommendation Hand wash.
Layer medieval with high neck and no hood. Closes with a button and has openings on the sides so that you can keep the heat in while moving the arms. Circumference: 154 cms. 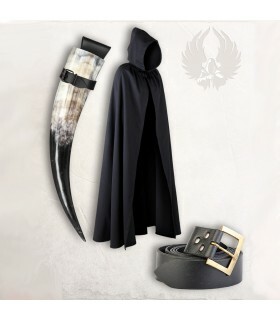 Layer-medieval gorget made with real leather and adjustable Hispanic goat by a front strap. Article handcrafted real leather and top quality. 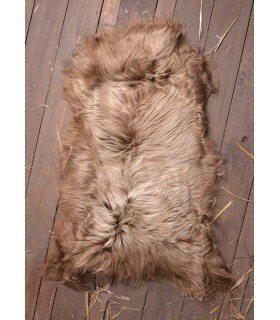 Beautiful natural skin Scandinavian sheep with long, soft hair. Ideal for confeccionarse Viking and medieval supplements. 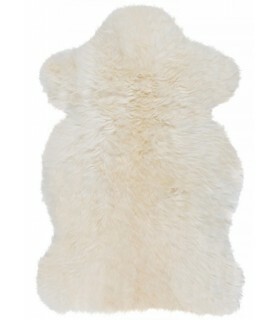 Stole fox fur, 120 cms. 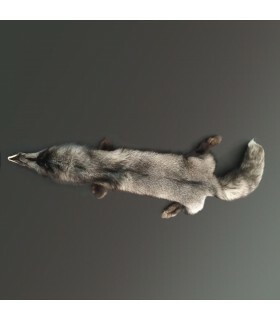 Stole of real fox fur. It was used by warriors as a pledge of shelter. It is often used in fantastic series. 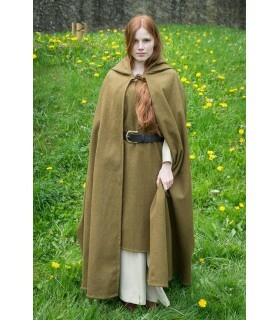 Ideal as a complement of medieval and period costumes. Layer Renaissance Aramis long to hip high neck and embroidery. The layer is designed to give a touch of glamour to your outfit and can be worn over one or both shoulders. 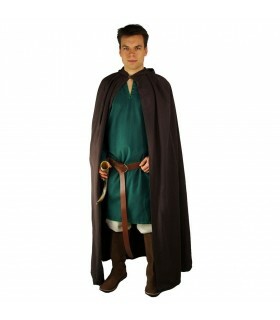 It is ideal to complete your costume of musketeer or any other costume of the Renaissance period. 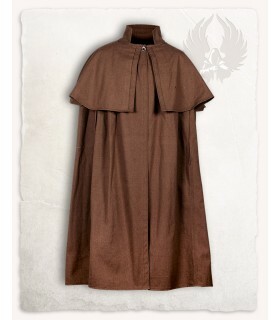 Layer medieval brown with tippet. Closes in front with a button. 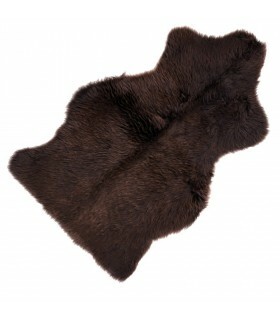 On the sides it has 2 openings so that the user can maintain the warmth while using the arms. Made of cotton. Circumference: 154 cms. 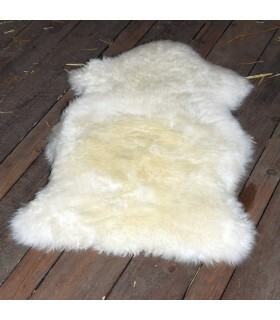 Lamb skin soft in color natural white. The total length of the skin is 90 cms. Each piece is unique and may vary slightly from one another in terms of measurements, color and hair. The length of the hair is 50-70 mm should Be hand washed with special soap. 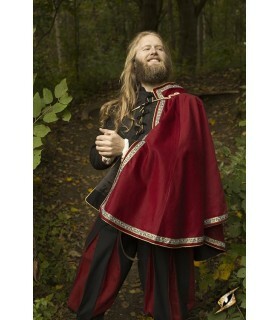 Layer the knights Templar with the cross of velvet red embroidered on the shoulder. The coat is made of 100% high quality cotton. Includes the closure of leather and brass. 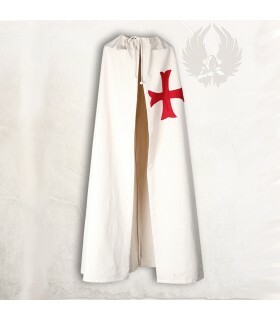 It is an indispensable complement to your outfit of the Templar Order. Layer Calatrava with the cross of velvet red embroidered on the shoulder. 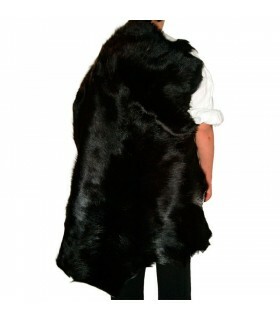 The coat is made of 100% high quality cotton. Includes the closure of leather and brass. It is an indispensable complement to your outfit of the Order of Calatrava. 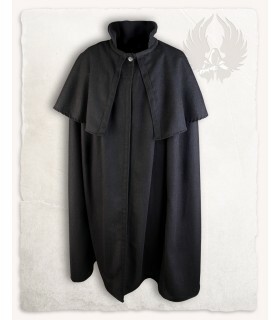 Layer Teutonic with the cross of velvet black embroidered on the shoulder. The coat is made of 100% high quality cotton. Includes the closure of leather and brass. It is an indispensable complement to your outfit of the Order Teutonic. Layer Hospital with the cross of velvet white embroidered on the shoulder. The coat is made of 100% high quality cotton. Includes the closure of leather and brass. 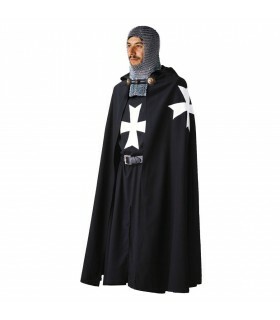 It is an indispensable complement to your outfit of the Hospitaller Order. It is a kind of clothing that people wear when is cold outside, besides it can be used to hide someone's identity by means of its hood. It is usually worn over the shoulders until the knees or ankles, showing two kind of fasteners, ribbons and clasps. 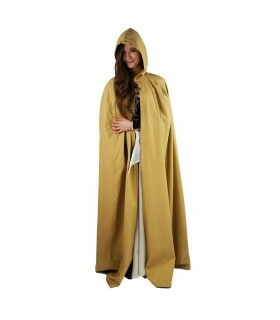 Roman people were the first ones that used cloaks. 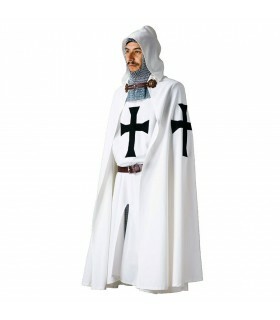 Richest members of this society, such as doctors, actors, teachers...normally wore colours cloaks. 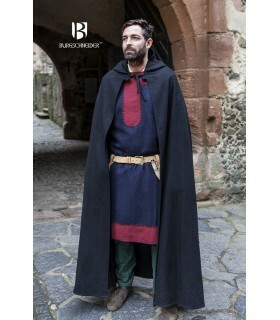 In Ancient Rome, soldiers wore cloaks withouth hood above all in nordic wars/battles due to their low temperatures. 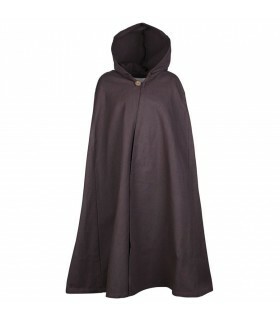 During Middle Age, cloak was also very used given that it protected from wind and rain besides getting bodies warm. 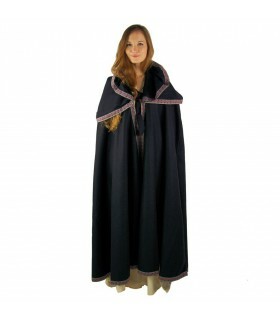 Nobility used warm and decorated cloaks, sometimes embroided. While peasants wore them in dark colours and low qulity materials. Most of the times they had two kind of fasteners, ribbons tied and clasps around the neck. 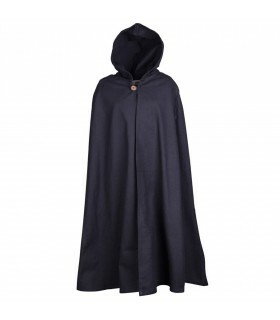 Thieves used cloaks with hood in order to not be recognised in a night robbery. 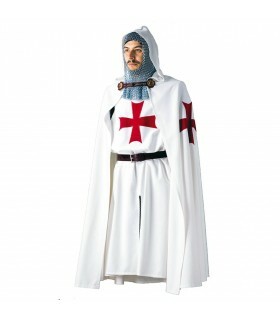 Templar Knights wore a white cloak with a cross that covered them for journeys riding a horse. 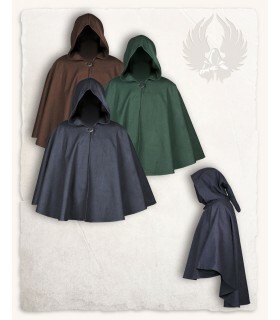 Musketeers also wore cloaks/capes which normally were in blue colour. 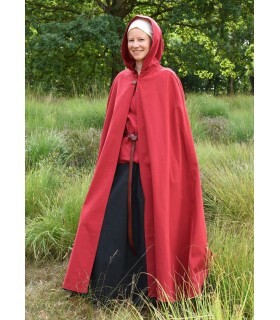 After the Renaissance, cloak became less and less important, until World War I where soldiers wore simple wool cloaks in nordic front. 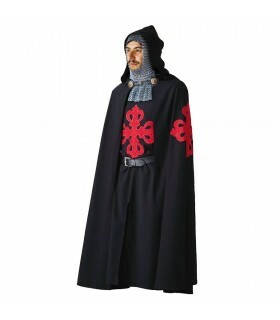 In Spain, Civil Guard wore cloak until 80's but finally this clothing was retired from the uniform. 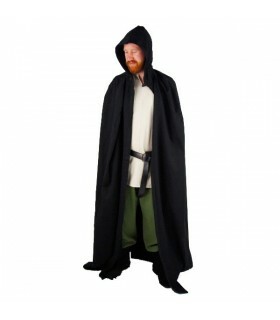 All over the world, military forces wear cloaks as a formal dress' complement, it meas they only wear it in special events. 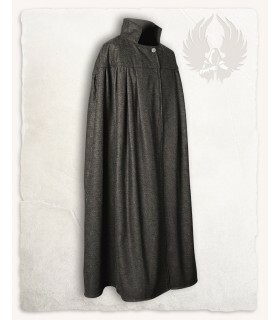 Cloaks can be made of different materials, given that they are used in different seasons of the year. Wool, which is mainly used in winter. Cotton, which is mainly used in spring and autumn. Synthetic, which does not cover a lot that's why must be used when temperature is not very low. Natural skin, they cover a lot so they can be used when temperature is low. 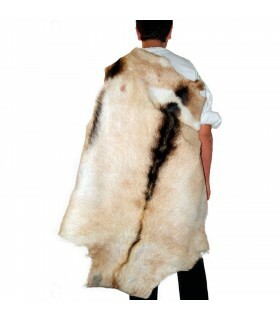 They ususally cover the back (goat's skin) or the neck (fox's skin). 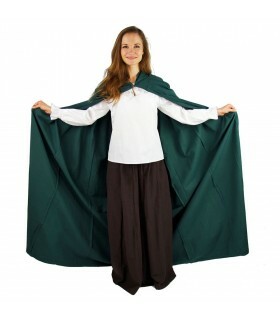 Cloak is the perfect clothing for covering oneself in medieval festivals. 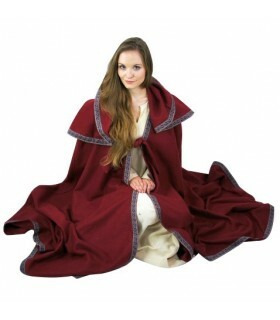 We have all kind of cloaks, with or withouth hood, templars, vikings, for spring and winter... If you do not know which one to choose, do not hesitate to contact us. Do you have any further questions?